Nitrogen Dioxide — is one of the most common atmospheric pollutants. Stimulates acid rain, affects the respiratory tract and lungs, causes changes in the composition of blood, in particular, reduces the content of hemoglobin in the blood. Climate Wikience makes possible to quickly build air pollution risk maps using satellite data with high resolution. 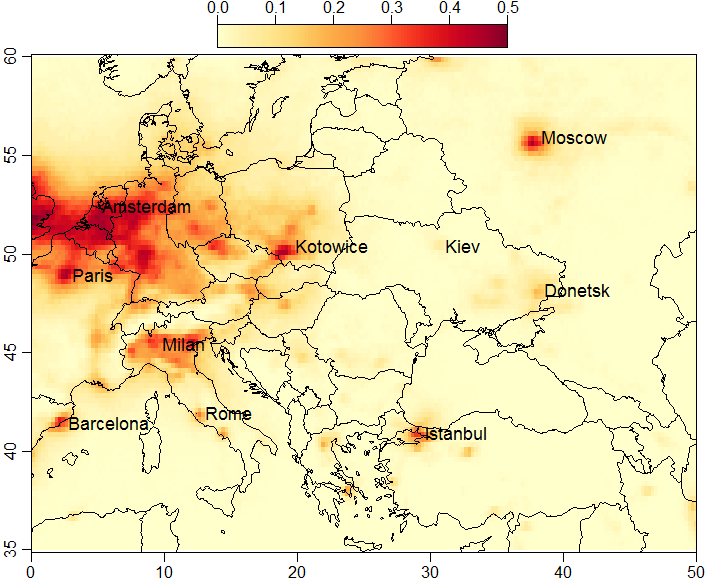 High resolution maps of air pollution risks allow answering many important questions in the domain of ecologic safety. For example, what countries have the highest level of air pollution and what is the relative level of air pollution between different regions inside a country. ~27,5 km × 18 km (0,25° × 0,25°). Aura OMI satellite data 01.10.2004—31.12.2012. The map color scheme is selected to be good for grey-scale printing. If you would like to print the information from this post, please refer to a publication. The air pollution risk is defined as the probability of observing a pollutant concentration in a given interval over the territory under investigation. The risk is calculated for each grid cell. This risk calculation technique is simple yet delivers extensive understanding of typical air pollution character. The risk of pollution for a grid cell equals to R(a, b) = S(a, b)/T, where S(a, b) is the number of days with nitrogen dioxide concentration in [a..b] interval (Dobson Units), and T is the number of days for which nitrogen dioxide measurements are not missing due to clouds or other reasons. Both S(a, b) and T are calculated for each grid cell. This method, unlike previously proposed air pollution assessment techniques, takes into considerartion the whole available time interval, is resilient to outliers and tailored to building maps using Earth remote sensing data. Pollution categories for NO2 are experimentally and subjectively defined as: 0.0..0.2 DU – low, 0.2..0.4 DU – moderate (open in Google Earth), 0.4..0.6 DU – high (open in Google Earth), 0.6..0.8 DU – very high, over 0.8 – disastrous. Category intervals were selected to account for as many as possible NO2 pollution features (visually) and keep the number of categories acceptable. To build the risk map, satellite air pollution data were used (Aura satellite, OMI instrument) during 01.10.2004—31.12.2012. Data are available daily and globally. Rodriges Zalipynis R.A., Ecologic assessment of air pollution by nitrogen dioxide over the territory of Europe using Earth remote sensing data, Journal of Informatics, Cybernetics and Computing Machinery, № 1(19), 2014. – 162 pp. – P. 126 – 130. Rodriges Zalipynis R.A., The place of Ukraine in Europe according to the level of air pollution using Earth remote sensing data, Proceedings of IV All-Ukrainian Congress of Ecologists with International Participation, Vinnytsia, Ukraine, 25 – 27 September, 2013. – 552 pp. – P. 130 – 132. Rodriges Zalipynis R.A., Risks of air pollution by aerosols over the territory of Europe, Materialy IX Mezinarodni Vedecko – Prakticka Konference “Veda a technologie: krok do budoucnosti”, Prague, Czech Republic, 27 April – 05 March, 2013. – P. 35 – 42.